This is an important alternative to residential care. As we become older, many of us wish to remain as independent as possible whilst staying in our own home, amongst familiar surroundings. Acquire Care can make this possible. Our helpful friendly carers can help you live how you wish. The live in care supplied would follow a tailor-made care plan to fit in with your existing preferences but would be reviewed frequently and therefore be flexible. As the name suggests, the carer would live in the house with the person they are looking after. Live-in care means peace of mind for you and your family as someone who is caring and responsible will always be there. We provide live in care services in Oxford and throughout Oxfordshire, a private bedroom must be available for the carer. The resources for their meals must also be provided. Training our carers to the highest standard possible is an important part of Acquire Care’s ethos. By having a specialist trainer with in-house training facilities based in Oxford, we ensure that all our carers are fully trained and vetted as required by the Care Quality Commission. This includes the completion of Independent Safeguarding Authority and Disclosure Barring Services checks. These were previously known as Criminal Records Bureau checks. References are also required. The training covers everything from Moving and Handling, Health and Safety to Food Hygiene and Medication. Throughout their career, our carers will be assessed with on-going training given. This means that as your needs change, the carers will be able to adapt and assist you at all times. Our carers always carry an Acquire Care identification badge and wear an Acquire Care uniform. Please contact us on 01865 601010 for a free, no-obligation meeting. This will be arranged in your own home at a time that is convenient to you and your family. Alternatively email info@acquirecare.co.uk for more information or any questions you may have. Click here to request an information pack. 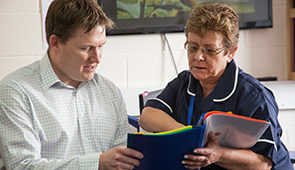 There are a range of effective, helpful and friendly care services that can be provided. These are all tailored to the Client’s needs. The services include personal care and support through to shopping and collecting prescriptions and even walking the dog. "I would like to say how grateful we all are to the team of carers who looked after mum during her stay here. Thank you to all of you." "Thank you for the excellent care of Enid provided by you and your assistants over the past 10 months. This has enabled me to keep her at home for longer than otherwise would have been possible. She appears to be settling down well, where I hope she will receive as good care as you have given." "I would like to record my sincere gratitude and appreciation for the care delivered by your staff to my wife. They were most attentive, considerate and caring; excellent and professional in every way." "Thank you SO much for the TLC you gave Alan and confidence you gave us both that his care would be (and indeed was) of the highest order. With grateful thanks." "I would just like to thank you so much for your kindness in the last few days of my mum's, Eileen, life. She had her wish to pass away peacefully in her own home." "Thank you so much for your kindness and support during the time we have been caring for Chris. Your thoughtfulness and professionalism helped so much to make Chris's life pleasant and enjoyable!" "Thank you so much for the brilliant care my dad received. He wanted to be at home and you all helped to make that happen. I cannot speak too highly of the care you gave." "...I feel compelled to tell you how much my relative appreciated the care and attention she received from the staff of your organisation. Dignity and independence remained paramount concerns until the end." "I would like to express my gratitude for all the helpfulness and consideration which we have received throughout from you and Acquire Care." "I just wanted to personally say thank you to all the Acquire Care carers for the humility, care and assistance you showed my mother over the many months of which she/we required your help. The care you all showed meant I and my family could rest easier during the daytime and evenings when we were unable to be present to support my mums needs." "Would you please tell all your carers that have looked after Brian how much we appreciate them. They were all amazing and gave Brian very positive times. There was lots of laughter and Brian felt encouraged to communicate in their company." "Thank you very much for a very good service of care and care attendants, who were all very nice and did a very good job. Thank you very much once again." "Thanks very much for all your help and support which enabled mum and dad to stay together in their home. You always tried hard to meet our various requests - and usually suceeded! I'm very grateful for that. Thanks again." "Acquire Care have engaged exceptionally well with my client; during my visit today I found her to be happier and more relaxed than at any time since we began working with her. Acquire Care carer's have undertaken a series of tasks on behalf of, and with my client, and have taken the time, and displayed expertise in encouraging her to overcome anxieties which were previously quite disabling." "She was very complimentary about your attitude and professionalism. She reported feeling at ease and your approach made her feel calmer and less distraught at the loss of her independence." "I would like to thank you and your company for all the help you gave our family at a difficult time. I will happily recommend your services should the opportunity arise. Your staff were absolutely wonderful; professional, caring, attentive and helpful." "Delighted with the excellent quality of service provision which is delivered in an efficient, friendly caring manner by care assistants who are respectful and trustworthy. Dealing with your company has been professional, flexible and a pleasure, thank you all." "On behalf of my family, I would like to send you our heartfelt thanks for your care and support of Dad over the last year. As I hope you know, he was very appreciative and thankful for he care provided by all of your carers and to him every visit was special. We always felt that he was in safe hands which provided the support we needed as a family."